Malik was born in the middle of a war zone in the Nuba Mountains region of Sudan. There was a civil war raging all around him. This was his childhood normal. 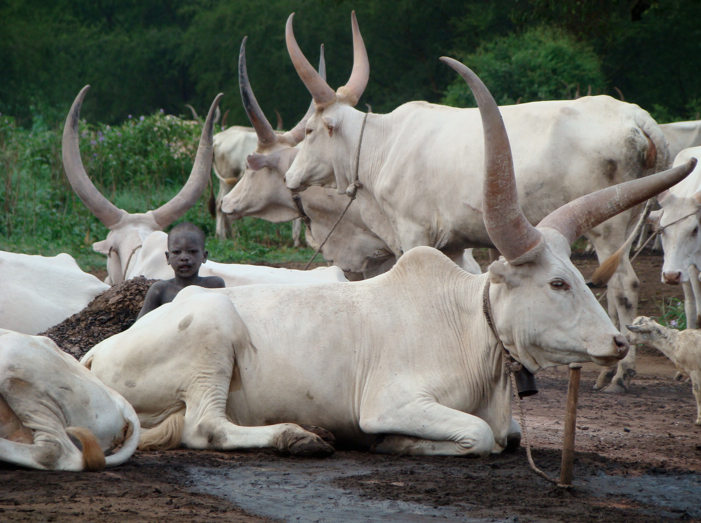 Like many other young boys in his homeland, Malik worked with the family cattle from an early age. “The first time I went to school, I was very young. I followed my older sisters to school. I was naked, so the teacher chased me away,” says Malik with a wry smile, recounting his eagerness to learn. 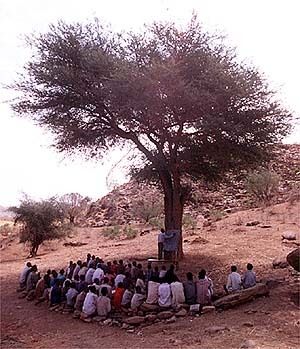 A school in the Nuba Mountains, circa 2001. His first classroom was the shade of a tree. 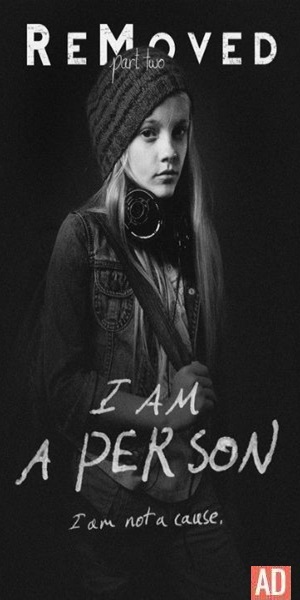 He crouched on his haunches, scratching the alphabet into the dirt with his fingers as the teacher dictated. When enemy planes flew overhead, he and the other children ran for shelter from the bombs. Sometimes class was canceled, and he didn’t study for weeks or months while the villagers hid in caves. Families still hide in caves and school is disrupted in Nuba when the bombs fall. Photo taken in 2012. Malik was always bright. He was the top of his class, and he learned English easily. As a young teenager, he was selected as a translator for international organizations that came through to offer relief to the war affected villages. 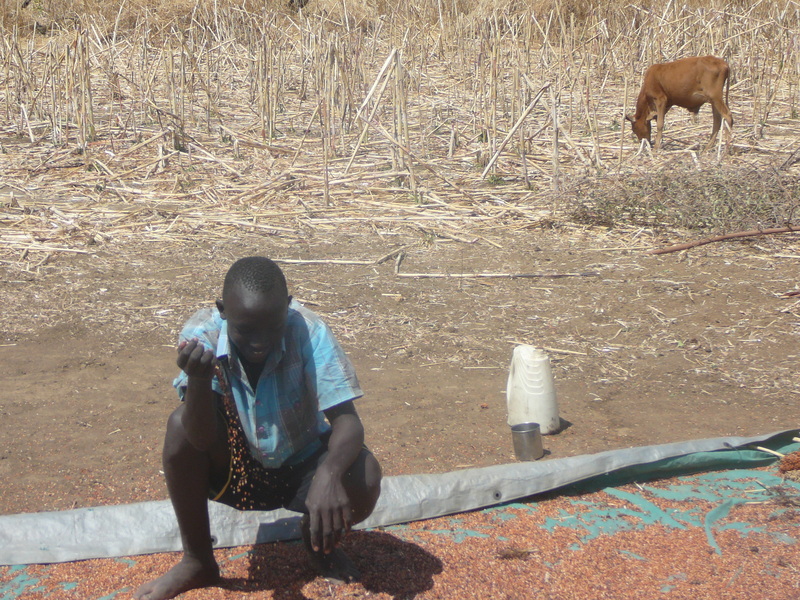 Malik inspects the harvest of sorghum after a long day’s work in Nuba Mountains. 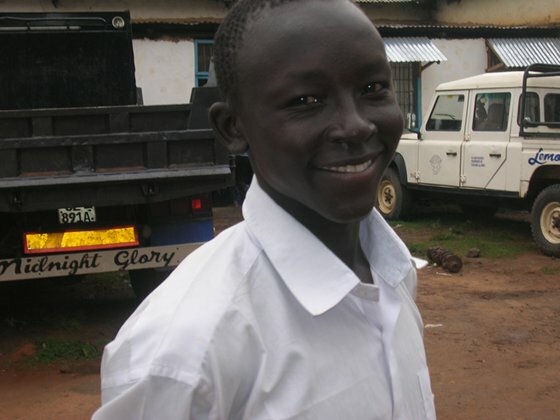 When he was 14, he left home and traveled hundreds of miles to pursue his high school education – moving from the warzone where he was born through two other African nations – first to South Sudan and then to Uganda. By the end of his first year of school in South Sudan, Malik managed to catch up to the other students, ranking number 2 in his class! He consistently ranked at the top of his class from then on. Today, Malik is 21 years old. He has overcome many challenges and got his high school degree. He was twice the captain of his school’s soccer team, and his favorite classes were chemistry and biology. He even graduated in the top ten of 992 students! 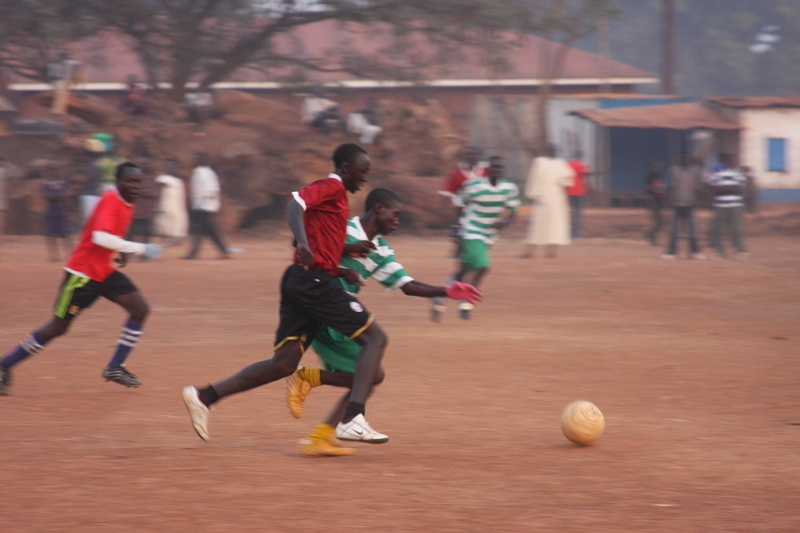 Malik plays soccer whenever he can, and he is an avid supporter of Chelsea FC. Malik dreams of becoming a doctor. Medical care is not available in his home village, and he remembers watching people die of preventable diseases. His goal is to get professional medical training to return with skills to serve his people. Because the nearest medical facility is a six hour journey from his home, he wants to start clinics in the Nuba Mountains to provide accessible and affordable medical care. When you give toward Malik’s education, you’re not just helping one young man go to college. You’re investing in the wellbeing and future healthcare of an entire region of Africa. Sometimes it takes a world to educate a child. Won’t you be part of Malik’s emerging story? *Even if we cannot meet the financial goal to send him to an American university, all funds raised will still be used to further his education. My Birthday is Coming Up | Send Malik to college! Would you please share Malik’s inspirational story with others? Posted by Jennie Joy on June 4, 2014 in Development, Hope, Intentional Living, Relationship and tagged African war child, ambitious, bachelors degree, birthday fundraiser, contribute, donate toward a good cause, dreams, education, give back, healthcare in Africa, higher education, how can I help, individual donors, invest in a dream, Malik Kafi Maki, MD, Nuba Mountains, pay it forward, pursuit of higher education, south sudan, student, Sudan, tuition sponsorship, Uganda, where is a good place to invest, worth investing in. Awesome story and thanks for sharing. Blessings.